In my last post about the faces photographed at Cleveland’s Westside Market I mentioned how friendly the vendors are at the market. 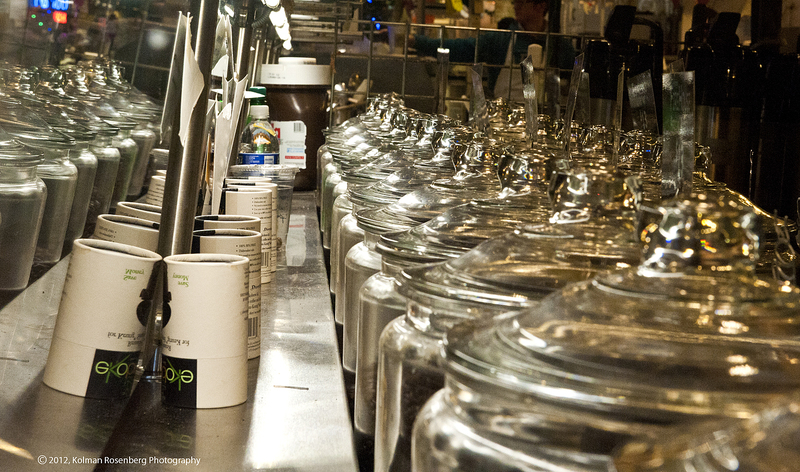 Relative to that comment, this photo is of coffee jars lined up and reflected at the “City Roast Coffee and Tea” booth at the market. As I stood at the end of this booth, shooting these jars from different angles and with varying apertures for a variety of selective focus photos, the worker at the booth asked me if I wanted her to move anything or change the lighting in the booth in any way. I was blown away by her willingness to help me, even while she had a steady stream of customers! The market is a remarkable place and I’ll surely return to “City Roast Coffee and Tea” for my liquid refreshment anytime I am there! The photo itself appeals to me for it’s abstract nature, it’s many highlights, and the reflection of the jars and cups in the back of the showcase glass. This entry was posted in Uncategorized and tagged Aperture, Booth, City Roast Coffee And Tea, Cleveland, Coffee, Cups, Market, Mugs, OH, ohio, Reflection, Selective Focus, Tea, Vendor, Westside Market. Bookmark the permalink.